No two lakes are ever the same so there is no rubber stamp that covers all situations when it comes to fish location. That is the beauty of fishing, you can put together a pattern that works really well on a given fishery and then travel twenty miles and find a completely different set of rules. Even on a given lake, different parts of a lake will have unique characteristics that set each area apart. Places with multiple personalities. Leech Lake in northern Minnesota fits that mold along with Devils Lake in north central North Dakota. Come mid-summer, the reality is that most major walleye fisheries will reveal several patterns happening in unison. There usually is no silver bullet where every walleye in the lake is following the same program. There are usually fish using deep structure, fish over basins, fish that are suspended and shallow patterns that might require weeds or wind. All of these different patterns happening at once often reflect the diversity of many forage bases. Fish that are keying on tullibee or smelt for example will be on a completely different program than fish that are focused on young of the year perch. Throw in several desirable forage fish along with invertebrate activity and the options on where to look is endless. Many anglers try to analyze the lake or forage and then work their way from the top. The old adage of angling… find a walleye’s meal and you will find walleye. The trouble with this mentality is that we often don’t know what the best option is until we spend some time on the water. I often like to approach fishing with a different mindset. Find walleye, sample as much water as possible and then figure out why the fish are where they are. At the end of the day, fish can be anywhere and they are where you find them. After the fact, you can figure out the reasons why and then try and duplicate the spot or pattern with better Intel but if you get ahead of yourself, you can sometimes make bad moves or decisions because you don’t know what you think you know. I have made that mistake many times assuming the fish were relating to a specific forage or pattern and finding out I was dead wrong. About half the time, the fish are where they should be and the other times, the fish are not where they should be so if you stay flexible while trolling, the times when the fish aren’t where they should be is a little less painful. Efficient trolling strategies that short line crank baits like the Salmo SDR Bullhead can produce staggering catches in shallow water on many lakes and reservoirs come late summer. This is why I love crank baits. Not because they match the hatch or look like something a fish will eat. Obviously a crank bait looks like a meal but more importantly, trolling cranks allows me to sample an amazing amount of water and allows me to look at a lot of different locations during a day of fishing. If you cover enough water and look over enough spots, you will sooner or later see signs of life. Many anglers rely on trolling cranks to break down basins, big contours and main lake water come midsummer but one of my favorite go to strategies is to troll crank baits along shoreline structure. As I write this in late June, we are already seeing a solid trolling bite develop on Devils Lake. The water came up a few feet this spring and the pattern has been trolling Salmo Hornets in the clean water between the inside edge of the old weed beds from last summer and the shorelines, often trolling in less than six feet of water. We have seen this pattern hold during past years all summer long. Especially on north shorelines where the weeds created a deep shadow during the middle of the day. Last summer, Jason Votova and myself trolled Salmo SDR Bullheads in the back bays of Lake Sakakawea in July and ran cranks right behind the boat in less than ten feet of water to catch some beautiful fish. We were focusing on submerged trees and bushes that were located along sharp shoreline breaks and the fish were stacked in these locations. These shallow patterns happen so often and the reality is that on some locations, you don’t have to troll to catch these fish but the advantage of trolling is that you can keep the bait running along the contour and you can cover water to find active fish. Some anglers struggle and get frustrated with shallow trolling patterns in particular because they worry too much about the boat spooking the fish. As a result, they let out too much line and that hampers your efficiency dramatically. I have made this mistake many times. If there is any stain in the water or wind, the fish just don’t seem to mind a boat passing by so keep the lures right behind the boat with less than fifty feet of line out. Sometimes, we are running cranks with only ten to fifteen feet of line out right behind the prop and catch way more fish. By shortening the amount of line out, you can easier follow tight contours and the efficiency increases because you are less likely to lose a fish when bringing the fish in on less line, less can go wrong and there is a shorter journey to the net. You can also crank lures up faster to clean debris and over the course of the day, you have your baits in the zone that much longer. I also believe the flash of the prop actually attracts fish especially in stained water. For whatever reason, fish seem spookier earlier in the season but as the summer progresses, they seem to become less spooky of the boat. Not sure if algae or other factors stain the water more or if fish that are more aggressive with a higher metabolism just react differently. With that being said, focus on efficiency. Stack the lures right behind the boat when following contours and put the boat right where the lures need to be. Avoid planer boards unless you have to use them. Some scenarios where we had to use boards included clear water with great visibility and open water along with flats or contours that just required a wider swath of lures spread out to contact fish but typically, the weed growth and scum is grown up enough by now where fouling baits is a part of life and you can get in and cleaned off much quicker without boards. Many anglers assume that fish are scared to death of the boat and feel like they have to either let out a lot of line or use boards but this mentality can often be a big mistake. Jason Votova and Jason Mitchell caught several respectable walleye on Lake Sakakawea last season with shallow crank bait trolling patterns while filming an episode for Jason Mitchell Outdoors. Typically, reservoir fish in particular are notorious for being here today and gone tomorrow but fish on lakes can also move plenty as well. Different wind directions and other factors that create on and off bites where you have to find the fish each day are perfect trolling scenarios. I also like to troll whenever I feel like I am wearing out my welcome on a spot regardless of presentation being used. If you sit on an area for two or three days in a row and the spot starts to wear out, trolling is a good way to cover water and find good spots again. Sometimes you can troll simply to find fish and then come in behind with other presentations and clean house. Other times, you can use the trolling game to find fish but also keep contacting new fish and stick with the program all day. Big spots are obviously the best for trolling but you can also make big moves and cover big amounts of water even when or if the sweet spots are small when you are in search mode. Keep the program simple and hang on, crank bait trolling patterns are explosive where you not only can find fish but also put a lot of fish in the boat. When fishing gets tough, pick up your speed and search. An average speed might be two miles per hour but don’t hesitate to move at three miles per hour or more. On really hot flat days when the bite is difficult, I often do the best by trolling fast with the big motor as the big motor makes it easier (psychologically) to troll fast and the big aluminum prop turning seems to turn on fish. In fact underwater, a big aluminum prop looks like a disco ball with all the light getting reflected. The amount of flash is incredible. This tactic especially works well when the water really gets dark or green from algae blooms. When covering water and trying to find fish and ultimately putting together a pattern, there are many misconceptions with trolling. The whole key for finding fish is to be amazingly efficient. When you are in search mode, you are basically looking to contact fresh pods of fish and you have to bank on the fact that there will be at least some fish in that school that is going to gun you down and eat. With that in mind, fish high in the water column enough where you don’t pick up debris constantly and fish as close to the boat as possible. By fishing close to the boat when possible, the efficiency goes up dramatically when exploring shallow patterns. Editor’s Note: Watch Jason Mitchell Outdoors on Sunday mornings at 9:00 am on Fox Sports North. 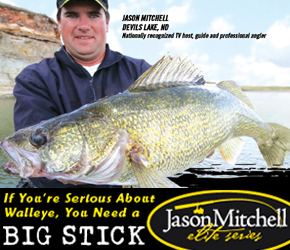 More information can be found online at www.jasonmitchelloutdoors.com or on the official Facebook Page of JMO.